A lot of people like a bit of ketchup as an accompaniment to their food, but the idea of consuming an entire bottle in one go doesn’t really sound appetising. Several individuals set world records for extraordinary feats, but some people do bizarre things in their bid to make it into record books. 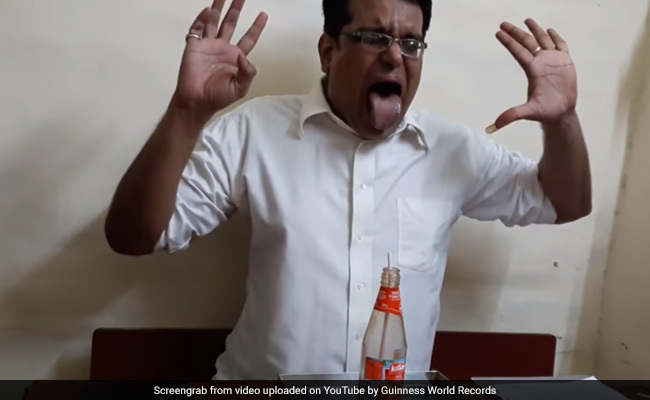 Dinesh Shivnath Upadhyaya from Mumbai took is love for ketchup to a new level when he drank tomato sauce from an entire bottle in just 25.37 seconds. The man drank 95 percent ketchup from a 396 gram bottle using a straw to set the record which could even make ketchup levels uneasy. Upadhyaya also has records like eating most grapes in three minutes and most oranges peeled and consumed in three minutes to his name.